When you work or live in a noisy environment you are susceptible to hearing damage and possibly even hearing loss. Here are a couple of article that might be helpful in preventing this. “Noise pollution isn’t good. It interferes with our ability to hear sounds of higher “quality,” though quality is in the ear of the beholder. Listening to a 6-year-old screech her way through “Twinkle, Twinkle, Little Star” on a pint-sized violin might be ear agony to most, but to mom and dad, it’s music to their ears. The fact is that noise is a form of pollution, but unlike the black smoke pouring out of coal-fired, generating plants, you can’t see noise, or taste it or find it on your clothes. It’s invisible, yet it’s the most widespread form of pollution we have, and that’s not a good distinction – most pervasive, insidious, dangerous pollution in our environment is not a badge of honor. Even so, most of us are not only unaware of noise pollution; most of us seek it out. Yep, most people like noise. They even pay money for it. Now, who’d pay money for noise? Chances are, you have and you do. When you go to the googolplex to watch the latest movie, you want to feel the explosions in your gut and experience the blast on your skin. Now, how much did you pay for that movie ticket? What about iPods and MP3 players? Own one? Know someone who does? Well, those noise guns may not pollute the environment but they sure do pollute your ear canals and the rest of your hearing mechanism when not played at responsible listening levels. We buy surround sound systems for home use to get the full experience of watching 34 commercials a day in surround sound and hi-def. We like our choppers to have a throaty throttle and our sports cars to purr loudly while idling. Then there’s the general, background noise that bombards our ears throughout the day – at the office, on the factory floor, on the busy city sidewalk or in our favorite, albeit clamorous, bistros. Noise is everywhere. We can’t escape it, unless we want to live in a tent somewhere in the mountains without any contact. We like noise. It’s stimulating and adds to the richness of life. We’ve all experienced it. We all know the effects. That ringing in your ears when you leave that rock concert? It’s called tinnitus by hearing professionals and can last multiple days, during which time the stressed hearing system tries to heal itself as best it can – but the fact is that once hearing loss occurs it almost never comes back. And the effects are cumulative, which means they add up throughout a lifetime. So, every time you are exposed to dangerous levels of noise, your hearing is slowly wearing away. That’s part of the problem. Hearing loss is often gradual, taking place over years (but a little bit worse every day) and it’s painless. So Are You Doomed to Have Hearing Loss? No. In fact, you can enjoy healthy hearing for a long, long time, if you take steps to protect what hearing you have left. Increase your awareness of the noise around you, i.e. listen. You get through the day oblivious to noise because your brain has become so used to the sound that bombards your ear drums every second of every day. If there is a loud noise you are exposed to regularly, wear hearing protection when possible. Protect what you’ve got. Sound levels below 80 dB are considered safe. No damage. But since you can’t measure sound levels of your MP3 or surround sound rig, just assume it’s too loud and drop the boost a notch or two. Your ears will thank you years from now. Unplug daily. Regularly, too. If you’re an iPod addict, listen at normal, human levels for no more than 90 minutes a pop. Then unplug and give your ears time to heal themselves as best they can. Consider purchasing noise-cancelling headphones. These headphones are idea when listening to music when in the presence of background noise. Studies have shown the more background noise that surrounds you the higher you will turn your music up. If you can block out the background noise with your headphones, you will be less likely to increase the volume. A worthy investment – great sound quality, great hearing protection. Be aware of sounds in the workplace. 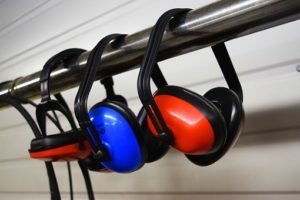 If you are concerned you are being exposed to excessive noise day in and day out, discuss this with your employer and request they have the noise levels measured in your work environment. Monitor recreational sound and use less of it. Recreational sound is noise you can eliminate or reduce. MP3 players and car radios are a few examples. Cover your ears. So elementary but for sure a no-brainer. When you know you’re going to be exposed to loud noise, at the Fourth of July picnic, for example, cover your ears. That string of Black Cats may not be sustained noise, but those poppers put out a concussive force that strains the ears, so cover up your ears with your hands. Wear protective gear around the house. A pair of foam ear plugs, available at any drugstore, will set you back a few bucks. Or, you can spend more for noise-cancelling headphones – on or over the ear. These bring you into a world of peace and quiet by electronically cancelling noise – unwanted sound waves. They’re great for household noise and power tools such as chain saws, leaf blowers and the lawn mower. See a hearing professional. If you’ve increased the volume on your telephone or TV recently, good chance you’ve got something going on in there (or not). So, make an appointment with a hearing professional for a totally, 100% painless hearing evaluation. You know it’s a noisy world. You live here. But there are things you can do to lessen the impact noise has on your entire body and psyche. Noise isn’t good. It’s ear pollution – and you don’t even know it’s there. Go pro-active when it comes to protecting your hearing and the hearing of loved ones (kids are even more susceptible to hearing loss caused by exposure to loud noise so check those toys before you buy). “Noise pollution is a serious issue that can have severe consequences on health. Noise pollution can affect the human body mainly in three different ways, Physical, Physiological and Psychological. Physical effects of noise pollution are direct effects on a person’s health such as hearing loss or tinnitus. Most experts agree that exposure to sound more than 85 dB for hours is potentially dangerous. And it is estimated that 30 million Americans are exposed to dangerous noise levels every day. To get an idea of the different decibel levels here is a listing of different decibel levels and the every day sounds that most reproduce that intensity level. The cost of hearing aids in the US can range from $1,500 to $5,000. By comparison, a simple pair of ear plugs cost as little as $0.50 if bought in bulk. Being mindful of the noise around us and taking simple precautions such as ear plugs while mowing the lawn, and breaking up time exposed to noisy vacuums can help in the long run. Physiological effects from noise pollution adversely affect health such as heightened blood pressure and stress. Research has shown that industrial workers regularly exposed to high noise levels have higher cases of nausea, headaches, argumentativeness, and changes in mood and anxiety. Based on the chart above, is your local landscaper wearing ear protection? Noise doesn’t just affect people during the day. Noise can affect sleep by causing restlessness and lowered REM. Studies of people that live near an airport report more stress headaches, increased blood pressure and overall being tense and edgy. Also, many studies have shown that children with chronic exposure to aircraft noise have reduced motivation and perform lower on standardized tests. It would be beneficial within a room to simply add a product like Silent Wrap to block out unwanted noises. Peace and serenity goes a long way to making the mind and body a happier place. Dust Monitoring Equipment – providing equipment, services and training in dust fallout management to the mining industry.